The Arthropoda phylum is a huge group of invertebrates. It has more varieties of species than any other phyla. There are all sorts of arthropods that make great pets. These including the arachnids (scorpions, tarantulas, and whip scorpions), the myriapods (centipedes and millipedes), hermit crabs, and more. There is such a large variety of these fascinating creatures to choose from, that anyone can find a perfect pet. Some arthropods are very colorful, others are simply awesome with an almost alien appearance and antics. Behaviors of the different land invertebrates can be anything from lethargic to highly active, very slow moving to speedy, or shy and reserved to highly aggressive. Whether you already know the which type of invertebrate you want or are simply looking for something different and interesting, the information on this care sheet can help you understand the housing, foods, and care requirements to keep these critters as pets. Then learn about your individual pet's behaviors and needs. Understand the type of pet you are getting to know what to expect and what to do. This will maximize your enjoyment, as well as the life and health of your pet. Find each of the land invertebrates listed on main index pages by their type. 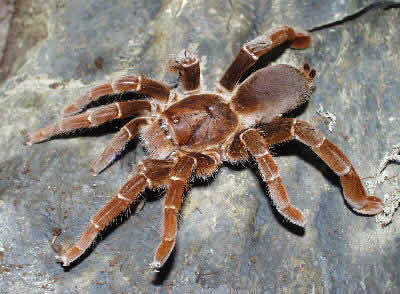 Types of Arachnids can be found under Scorpions, Tarantulas and Spiders, and Whip Scorpions. The types of Myriapods can be found under Centipedes and Millipedes. Characteristics of Arthropods The phylum, Arthropoda, contains all the invertebrate animals that have jointed legs and stiffened exoskeletons (usually made of chitin), such as insects, spiders, crabs, myriapods, and scorpions. Invertebrates are animals that have no backbones and they make up the bulk of the animals. About 97% of all the animals known to science are species without backbones. Land-dwelling or terrestrial invertebrates include arthropods (insects) like the arachnids (spiders), and a lot of others. Land invertebrates that are enjoyed as pets are discussed These arthropods include the arachnids (scorpions, whip scorpions, and tarantulas), centipedes, hermit crabs, millipedes, and others. Learn about different types of invertebrates to be sure you get one that will fit you and your lifestyle. A few of the more common invertebrates are handleable, while some of the more specialized invertebrates are best kept just for observing, not handling. Decide which type you are interested in so you won't be disappointed. For example a hermit crab is easy to handle, but a large centipede can give a very painful pinch, not a handleable pet. If you know about the type of invertebrate you are getting, then you will know what to expect. Be sure you are prepared to deal with feeding and cleaning requirements. Check on your pet every day. This will keep you aware of what's going on with your invertebrate and you'll know if anything needs to be fixed or changed. Have fun enjoying this fascinating world of intriguing pets! Invertebrates as PetsPeople have a variety of reactions to arthropods from disgust as they see a cockroach scampering across their kitchen floor, to enjoyment when they think about a shrimp or lobster dinner, or with awe when they see a beautiful butterfly. But no matter which type of invertebrate it is, the interesting appearance and behaviors of arthropods make them a fascinating group of animals. Land Invertebrates make ideal pets in many ways. They are very quiet and most require very little space to house them. They are also easy to take care of with a minimal amount of cleaning and virtually no odor. Probably one of the most common land invertebrates enjoyed by all types of pet lovers is the popular hermit crab. Along with the hermit crab, many other invertebrates are now becoming increasingly popular. Many of the more docile invertebrate species are now readily available in pet stores. Invertebrates can make interesting and unusual pets. Note: Some invertebrates are not for the beginner! Invertebrates that are potentially dangerous should only be kept by an advanced hobbyist. The enjoyment of keeping arthropods as pets starts with having creatures that are fascinating to watch. Then there is the excitement of designing and building their habitat. Creating an exotic jungle forest or an arid desert habitat in an enclosure in your home, is another pleasure of keeping arthropods. Is an Invertebrate pet right for you? A beginning keeper should start small with one or two of the hardiest and calmest species, to gain the important experience required. Many arthropods should only be kept by advanced keepers with plenty of experience keeping potentially dangerous animals. Most invertebrate pets are best not handled. Hissing roaches, hermit crabs, millipedes, stick and leaf insects, and some of the mantids can be handled. But others are kept as visual pets, and not suited for handling. Many of the invertebrates on the pet market will stress easily. Some are very quick, and will jump and injure themselves. Some may deliver a very painful bite or dangerous sting when agitated or frightened. Be sure to learn about the invertebrate you are interested in to determine if it is the right pet for you. Types of Cages for Invertebrates There are nearly as many different kinds of cages and enclosures for pet invertebrates as there are types of arthropods being kept. Some keepers use plastic shoe boxes and sweater boxes while some keepers use plastic jars and other containers. Glass aquariums, commercially available screen cages, acrylic boxes, and many other enclosures are commonly available at local pet stores as well as reptile and insect shows. The type of invertebrate being kept will dictate the type of housing that you will need. Here are some of the enclosures that work well in keeping captive invertebrates healthy and "stimulated". Plastic containers such as sandwich tubs, shoe boxes, sweater boxes and gallon jars are available in a wide range of sizes, shapes, and prices. They are typically inexpensive and easy to find. With a little ingenuity you can take the plastic lid off a plastic gallon jar and cut away a "window" in the top with a small saw, dremel tool, or sharp X-acto knife. Over this hole, you can hot glue a small section of window screen (available at a local hardware store). This modified lid works great for a wide range of invertebrate pets. Glass and acrylic terrariums can be wonderful enclosures for invertebrates. A lower profile terrarium works well for terrestrial species and vertically oriented terrariums work best for the tree dwelling, arboreal species. As the invertebrates grow, they will of course need larger and larger enclosures. Aquariums are also relatively inexpensive and can be adapted as a terrarium. They are available in a variety of sizes and look nice when set up in a special part of a keeper's home. Unlike terrariums they do not come with a screen top, which provides for necessary ventilation. However, secure screen tops are available for many sizes of glass aquariums and are usually easy to find at local pet stores. Custom built aquariums are also popular and if a keeper has the tools, they can be built inexpensively in a variety of sizes. Some keepers choose to keep their invertebrates outdoors for all or part of their lives. Outdoor enclosures in moderate climates can provide the ultimate environment for your invertebrate pets. Be sure that you provide outdoor enclosures with secure screen covers that allow sunlight in and keep predators out. Predators of invertebrates can take many different forms such as birds, cats, mice, and even ants. Cage CareKeeping a clean invertebrate environment depends on which species your have, but most are very clean naturally and need to be cleaned only about once a month, or for some only every six months. Where you use a soil/sand mixture in the substrate, many invertebrate's feces will decompose into a crumbly black humus and blend into the substrate without any noticeable odor. One thing all invertebrate enclosures need is regular maintenance. This means removing any uneaten prey and noticeable debris regularly. This will help to protect them from harmful micro-organisms and parasitic infestations. You will also need to monitor your pet's water or moisture regularly, misting the substrate or adding fresh water as necessary. Everything you put into their home should be washed and disinfected. This includes dishes, floor coverings, and cage decor. Never clean with a phenol such as Pine Sol. Chlorine and alcohol based cleaners are tolerated much better, but need to be thoroughly rinsed. Sand or logs that you collect from outside should be cleaned and bleached. You can also sterilize them in a slow oven (120 degrees to 150 degrees) for two to three hours. Wooden limbs can be sealed with polyurethane varnish to seal any holes where parasites might be hiding. Cage Supplies and Requirements The housing requirements for most cages and terrariums consist of four basic elements; heating, lighting, floor covering, decor and cleaning. The items used to supply these elements sometimes overlap, as in heating and lighting. An invertebrate from a hot, sunny environment is going to require plenty of environmental heat in its enclosure. For those species that require hot, arid environments, you can add a small wattage heat lamp over their enclosure and use heat tape or heating pads under one end of the enclosure, the "hot" end. Be careful not to place an invertebrate's shelter directly over this heat source as heat will be trapped in the shelter and can reach lethal levels. Keep in mind that most desert species live in deep burrows that remain somewhat cool and humid, even during the hottest days of the year. You must give these desert species access to a cooler, more humid area in their enclosures. Note: Glass enclosures will heat up to dangerous levels very quickly. Be sure not to put glass aquariums outdoors on sunny days. Also, aquariums near a sunny window can trap warmth and can heat up very quickly, potentially killing your pet. Insects and arachnids that are active by day are called diurnal. They move between hot, sunny areas and cooler, shaded areas to regulate their metabolism behaviorally. You can mount UVB-emitting bulbs in fixtures over mantids and species that are diurnal. You can also use bulbs that emit both UVB and heat mounted in a ceramic fixture on a sturdy screen top for all diurnal species, especially mantids and phasmids. Most invertebrates are nocturnal, which means they are active at night. most keepers feel that expensive UVB-emitting bulbs are not important. To observe nocturnal species, you can use a light fixture with a blue or red bulb mounted within the enclosure. These lights allow you to watch the animals at night while not interrupting their nighttime activities. Be sure to provide enough water or moisture for your pet. In captivity, many invertebrates die from dehydration. Even desert-dwelling animals will need access to water. Provide water in a shallow dish or spray the area underneath their shelters with water once or twice a month to keep it moist. Depending on its life in nature, a captive invertebrates will require anything from a damp, humid enclosure with frequent mistings to an arid habitat with low ambient humidity and only its prey item as a source of water. For more tropical enclosures, daily or twice daily spraying may be required. For forest enclosures, less frequent spraying or a drip system may be enough. Note: Inexperienced keepers kill many invertebrates from simply not offering their pets enough moisture. Place a plastic container with a perforated bottom on the screen top of the enclosure. Fill the container once a day with water and let it drip into a dish in the enclosure. During a "rainy season", also spray the enclosure once a week. We feel that our drip system helps keep moderate humidity in the enclosure by allowing the water to drip into a small space of the cage. Many captive invertebrates that require high humidity also require well-ventilated enclosures. This can be difficult to achieve as a well-ventilated cage typically does not stay humid and an enclosed cage stays humid, but air within it can become stale, mold can grow and become dangerous for the animal within. There is a growing movement in the hobby for the establishment of beautiful and elaborate vivaria for invertebrates. The business of selling driftwood, cork bark, live moss, misting systems, colorful sand, and supplies is thriving. Many keepers, especially those keeping only one or two special pets, are choosing naturalistic setups for their invertebrate pets. Substrates are an important addition to the look of these naturalistic setups. A mixture of damp sand and coconut bedding such as T-rex Forest Bedding works well for many invertebrate's enclosures. It is not only natural, it holds moisture well and the acidity of the coconut bedding seems to keep the development of mold or fungus in check in the more humid enclosures. Many keepers use a mixture of damp sand and peat moss for their enclosures. This mixture works very well for most invertebrates. It is natural and the peat moss will hold moisture for several hours to several days after it has been misted with a spray bottle. Note: There is some concern about invertebrates ingesting sand as they pounce on prey. However, healthy invertebrates will simply pass these small amounts of sand with their feces. This no doubt occurs in nature and seems to cause little or no problems. Small invertebrates, especially small tarantulas, are often kept on paper towels, especially in the early days when they are kept in vials or small containers. This is an easy to manage "substrate" as it is inexpensive and easy to change when it gets dirty. However, for inexperienced keepers, it is often difficult to determine when the paper towel is too dry as it doesn't't darken as does peat or sand. Vermiculite was a touted substrate in the early days of keeping tarantulas. Note: Most keepers have moved away from vermiculite as a substrate for various reasons. Vermiculite often sticks to invertebrates (when it is dry and has become very lightweight) and swells if ingested, causing impaction and death. There is no doubt that the addition of driftwood, cork bark, stable rock piles, and other cage decorations is important in keeping captive inverts healthy and stimulated. These decorations provide important hiding places which keep invertebrates less stressed and provides them with proper molting areas. Be sure that any cage decorations are firmly resting on the bottom of the enclosure and that the substrate is pushed up against the object. If a terrestrial species digs under a flat rock or other heavy object that is not resting firmly on the bottom of the enclosure, the object might settle onto the animal and crush it against the bottom of the enclosure. This accident is fairly common in the collections of beginning hobbyists. If you collect branches and other decorations from outside, be sure that they come from an area that is not sprayed with pesticides and that they are non-toxic. Rocks and stones can be sterilized in a light bleach solution (one part bleach to five parts water) and then scrubbed with a soap-filled sponge and rinsed thoroughly before they are added to the enclosure. There are a variety of reptile shelters on the market that can be easily converted to use with invertebrates. Some of the best are the natural-looking rock shelters and slabs or tubes of cork bark. Most of these are easy to clean and sterilize and are in sizes perfectly suited for invertebrate enclosures. Cage decorations provide your invertebrate pet with wonderful places to explore and also wonderful places to hide. Most invertebrates hide as a way of life. When you provide them with hiding places they use them, and this obviously cuts down on your viewing pleasure. It is a fine balance but setting up naturalistic enclosures are worth the tradeoff for the health of your animals. For nocturnal invertebrates (most of them), we suggest setting up a light fixture above the enclosure that houses a red bulb. This red bulb will allow a keeper to watch his or her invertebrate pet as it explores its enclosure after dark. Feeding and other exciting experiences a keeper gains from his or her pet can be timed for this part of the day. Scorpions, which fluoresce under UV light, can be watched at night using a simple blacklight fixture over their enclosure. Feeding, digging, moving substrate, and other activities in the dark are quite amazing to behold. Invertebrate Food and Feeding Many Invertebrates are primarily carnivorous, meaning they subsist on protein foods though some insects, such as crickets will also eat vegetation. Specialized carnivores, subsisting on only insects, and are called insectivores. Feeding both insectivorous and carnivorous species is usually simple and straightforward. They will need a diet consisting of a variety of live prey: Crickets, grasshoppers, mealworms, waxworms, flies, moths, and occasionally pink or fuzzy mice may be required. Small insects and arachnids will need to be fed tiny insects, and as they grow they will require larger prey items. All captive invertebrates should be offered a wide variety of prey rather than just feeding those that are easiest to find at the local pet store or bait shop. Many keepers, especially those with large collections, also raise several types of feeder prey in connection with their invertebrate collections. This insures that their prey items are well-fed and healthy and provide the best nutrients for their captive pets. Some feeder foods such as crickets, fruit flies, and wax moths are especially time-consuming to produce. One important aspect of producing your own prey items is that you can effectively control the health of the feeders and use them to provide your animals with the best possible nutrition. Gut-loading of crickets and mealworms is an important part of feeding your inverts. By feeding (gut-loading) your prey items a healthy diet, this is transferred to your animals. Note: We do not recommend gut loading crickets with ground dog food or cat food.